How Much Dividend Income Did We Earn in January 2018? Wow! Where in the heck did January go? It feels like I just got finished writing our 2017 dividend income results post and setting our 2018 goals. Time certainly has a way of flying by if you let it. That is why I think it is important to take a step back and enjoy the present. I love to plan ahead for the future (especially with earning dividend income), but we all need appreciate what we have each and every day. Okay … enough about that. Let’s get to the good stuff … our dividend income results for the first month of 2018! Last year we saw some really great growth for our dividend income … but we are expecting even greater things this year. January can be sort of a letdown month for a lot of reasons … especially after the flurry of activity and events in late December. The same can be said for earning dividend income. Last December was our best month ever for earning dividend income. Our January results are not even close to what December gave us … but that doesn’t mean this month was not important. Each penny we earn in dividend income is reinvested back into more stocks. Every new dollar that we invest helps to grow our future dividend income results. And anytime a company raises their dividends … we can celebrate more future income. The compounding effects month after month and year after year are truly incredible when it comes to investing. One last thing before we get to our results. Starting in 2018, we are updating how we report our dividend income results. In the past, we only reported our dividend income earned from taxable accounts like Robinhood and Fidelity. Back in the fall of last year, we finally rolled several past employer sponsored retirement plans into a Rollover IRA. This little step will save us a ton of money on fund fee’s. So by rolling over these plans, we started building out our tax deferred dividend income stream too. So our results from this point forward will include all of our dividend income earned – from any type of account we own. Now on to our results. 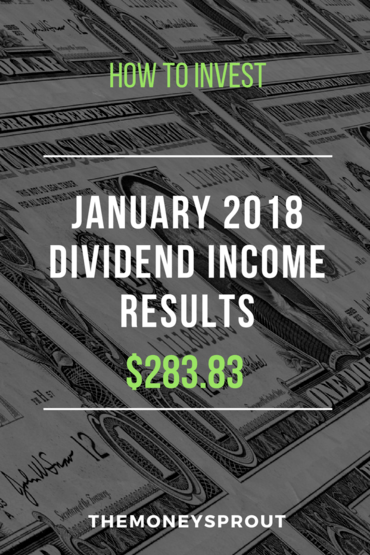 In January, we earned $283.83 in combined dividend income from all of our accounts (which we break down further below). This was our largest January ever for dividend income. Overall, we had 9 stocks pay out a dividend in January, along with a bond fund. We earned dividend income in both our taxable and tax deferred accounts. Awesome companies like Cardinal Health, SYSCO, and Wal-Mart gave our family a paycheck for basically not lifting a finger. How cool is that? Here is the breakdown of dividend income (by stock) in January from our taxable accounts. These include stocks held in our Robinhood, Fidelity, and AmStock accounts that will be reported as income earned in 2018. Here is the breakdown of dividend income (by stock) in January from our tax deferred accounts. This includes a Rollover IRA we recently built out from several past employer retirement accounts. Note – All of the dividends we currently receive are reinvested into new shares of the same stock using DRiP regardless the type of account. The only exception right now are any dividends received in our Robinhood account. They currently don’t offer DRiP, but at some point all the funds we earn are invested back into shares of a dividend stock. One of our favorite tasks to do each month is to update the dividend income we earned in our tracking spreadsheet. It is really fun to watch our dividend income grow month to month and year to year. This is probably one of the best ways to stay motivated in hitting our investment goals. Besides reporting our dividend income earnings, we also like to track how we are growing our future dividend income. We actually track this by reporting our future annual dividend income amount. This is a very simple calculation that takes the number of shares we own of each of our stocks and multiplies it by the current dividend of the company. The result is the amount of income we could expect to earn over the next 12 months … if we walked away today and never touched our portfolio again. Of course this calculation assumes the company’s we own will not cut their dividend … which is unlikely (but not impossible). There are 3 different ways we can grow our future dividend income – new investments, dividend reinvestment’s (or DRiP), and company dividend increases. We didn’t do a ton of new investing in January and are working to payoff some other bills from last month. Most notably are the property taxes we paid in late December and braces for our middle son. I expect new investments to pick up for us sometime in the spring. The total amount of new capital invested in January was – $189.57. We have a goal to invest $10,000 to $12,000 of new money into our taxable accounts in 2018. Most of these investments will come in a few months when we get our tax return. Note – These investments were not from new money, but rather funds rolled over from past employer retirement accounts. So while we are not counting these purchases as new investments, each has helped to grow our future dividend income. Most of the stocks we own are setup to reinvest the dividends back into more shares of the stock. There are a few exceptions, such as the stocks we own in our Robinhood account and a few others. Note – Dividends earned from stocks we own in our Robinhhood were not directly reinvested through DRiP. In addition, dividends from DIS and GPC were not reinvested as we didn’t get our DRiP setup in time for those companies. Any dividend income earned throughout a given month is always eventually reinvested at some point. My absolute favorite way to grow our future income is through company dividend increases. This is a very passive way to grow your income each year … assuming you pick the best portfolio of dividend stocks. The month of January started the year off strong with 6 announced dividend increases from companies that we own. The size of these increases was very strong across the stocks. It is because of these company increases that our dividend income stream will continue to grow every year … even if we never invest another cent. Just think about that for a minute. We increased our annual income by $40 and didn’t do a thing to get that. When we let that compound over the months and years, that number will continue to grow exponentially. We started the new year with a future annual dividend income total under $6,000 and grew it by $635.23. That is a very solid month for growth, although the majority of it came from investments made in our tax deferred rollover IRA. Most of our rollover IRA money is now invested and busy earning dividend checks, so we should be able to compare month to month increases that mean something starting in February. One new feature that I plan to cover now in our dividend result posts are the rule of 72 projections. You can read more about the rule of 72 here, but basically it is a calculation that shows how often your investments will double. Using the rule of 72, I have calculated (conservatively) that our dividend income will double every 9 years … without doing anything. Based on this, I can calculate out how our dividend income could grow (and double) based on our future annual dividend income number of $6,604.41 … earned on February 1, 2019. So by 2046, we should be earning over $52,000 per year in dividend income. 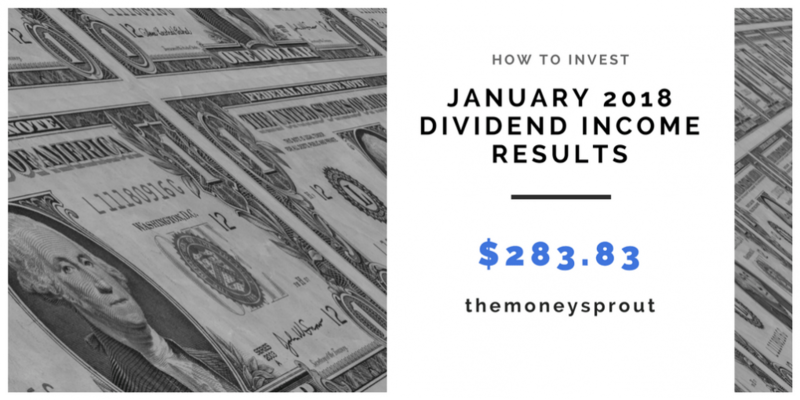 We got off to a fantastic start to 2018 by earning $283.83 in dividend income for January. Our goal is to earn $6,700 in dividend income for 2018. Those January numbers may seem like we aren’t even close … but we should even things out as we move through the year. In order to hit our annual goal, we will need to earn $6,416.17 in additional dividends over the next 11 months. That is an average of $583.29 per month. The good news is that most of our dividend income is earned in the months of March, June, September, and December. Not only did we post solid dividend income results in January, we managed to raise our annual forward dividend income to $6,604.41. This is basically the dividend income we would expect to earn starting today over the next 12 months … without doing anything. We raised our totals by $653.23, which is quite impressive, although most of that was from investing the last chunk of our rollover IRA money. One pretty cool thing though is $40.66 of that growth was from company dividend increases in January. If that happened every month, we would increase our dividend income by about $500 a year … from doing nothing at all! I look forward to a solid first quarter of 2018 and can’t wait to share our results. How was your dividend income in January? Are you actively investing and growing your portfolio or maybe waiting for a market correction? Full Disclosure – At the time of this writing, we owned shares in the following stocks and funds noted in this post – AMGN, CAH, CINF, CSCO, DIS, ED, GPC, HBI, INTC, MO, NSC, O, OHI, SYY, WMT, WSM, XOM, FSITX, and FSTVX. The material above is not a recommendation to buy. Please do your own research on a company before deciding to invest.